Trello vs. Asana – which is better project management software? For the last couple of years, I’ve used Asana as my project management software of choice. I’m not really sure why I originally chose to use Asana other than reading some articles about it and realizing how beautifully designed the tool was when I first saw it. Lately I’ve had so many people tell me how much they love Trello. So I’ve been testing it over the last few months to see if it’s as good as people say, and whether it’s a better fit for me than Asana. Trello is a simple but powerful web and mobile application based on the kanban board that Toyota popularized in the 1980s and used for their innovative supply chain management process. The user interface is a board (which typically equates to a project), filled with lists (categories) of cards (tasks or ideas). The default board has lists that are named “To Do,” “Doing,” “Done,” but you can organize and rename each board and list as you please. The card is the atomic unit of Trello, and here’s where you can create and assign a task or idea, build checklists, add notes, upload attachments, type comments, and more. 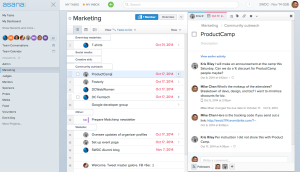 Asana is project management software with a bit more structure to it. 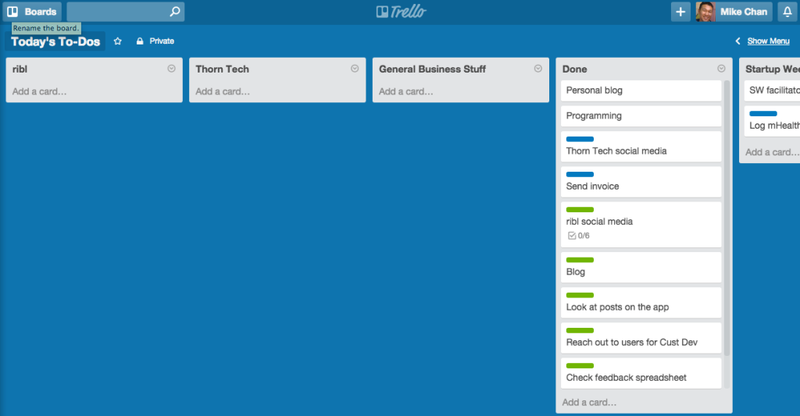 You can do anything with Trello; it’s not just limited to to-do lists and project management. The standard thing to do with Trello is to create boards where you can log and organize your tasks by project. I’ve created task boards for projects that I’m working on, such as ribl, Thorn Technologies (one of my consulting clients), Startup Weekend DC planning, and personal projects. But because Trello is so flexible, you can create a board for almost anything. I’ve created a Content Planning and Distribution board, where I log all the blog post ideas that come to mind as well as all of the channels where I can distribute my content. I also use Trello as a lightweight customer relationship management (CRM) tool for the sales and business development that I do for my clients and my consulting practice. I’ll create cards for each prospect and within each card I’ll log call notes and create checklists for follow-up tasks. As you can see, Trello is amazingly flexible and can be used to keep track of anything you can think of. 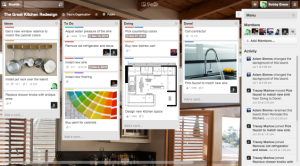 While Asana is beautifully designed, Trello is more of a visual tool. You can attach images and add color-coded labels to categorize cards. The app displays plenty of icons that represent checklists, votes, due dates, and more. You can even change the background image of your board. 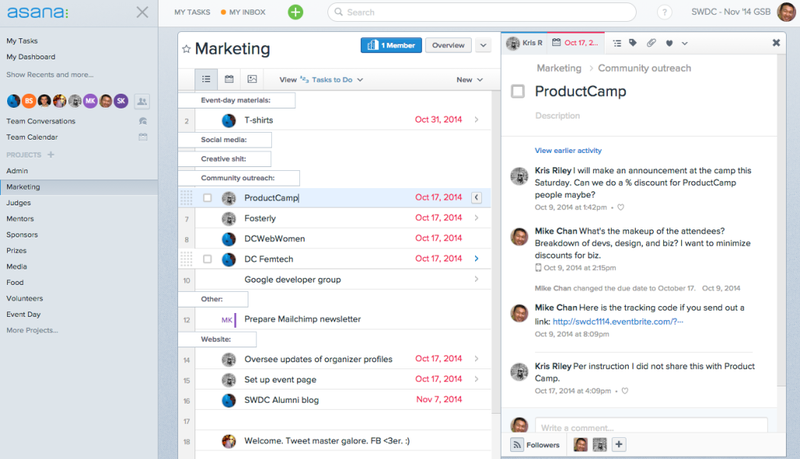 Check out the side-by-side comparison below, with Trello on the left and Asana on the right. I have a board that I call “Today’s To-Dos” that lists all the tasks that I need to execute today. Whenever I complete a task, I’ll move it from that project’s list to the “Done” list. And there’s something super rewarding about moving those cards, as opposed to checking off a box and having that task disappear, like in Asana. And at the end of the day, when I see the board below, I can be pretty proud of all that I’ve accomplished. While Trello’s flexibility is extremely powerful, it may be too flexible for people who are looking for a tool to provide structure in their lives. In this case, Asana trumps Trello. Asana provides many out-of-the-box features that will help you better organize your tasks and projects. The app lets you categorize your tasks by “Today,” “Upcoming,” and “Later,” so you know what you need to work on and when. 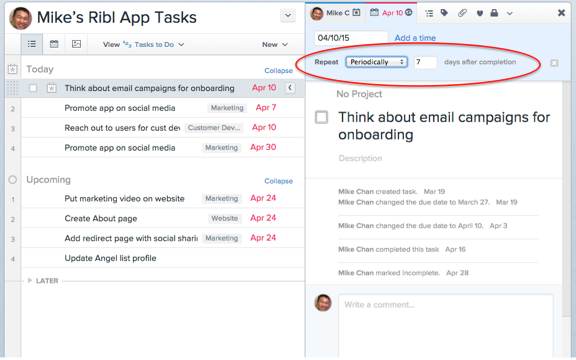 You can assign tasks to projects and easily navigate between views for projects and your specific tasks. A big part of the structure that Asana provides better than Trello is recurring tasks. If you have tasks that you have to execute on a repetitive basis (e.g. every month I need to invoice my clients), Asana allows you to easily set these recurring tasks with a couple of clicks. You need workarounds to do this in Trello. You can either manually copy cards over and over again, or just change the due date of that original card. You can also create weekly or monthly lists and copy those at the beginning of each week or month. Or you can use a Zapier integration to facilitate this. It’s just not that easy. Many people hate receiving email, and understandably so. But my workflow depends heavily on email, and Asana’s email reminders are amazing. One week before the task is due. One day before the task is due. The day when the task is due. Every day the task is overdue until one week has passed. Yes, that’s a lot of reminders (up to 10 emails for one task!) but it sure as hell will get you to either complete the task or change its due date. On the other hand, Trello will send one email reminder the day before the task is due, and that’s it. For those who want to avoid email, this is great. But for those like me who depend on email as kind of a to-do list in and of itself, one email reminder isn’t enough. Because of the more structured philosophy of Asana, the tool is able to better track project progress with dashboards. Asana provides visuals of how many tasks have been completed and remain, and allows the project owner to provide descriptions and status updates about the project. This is a nice feature to get a quick snapshot on how the project is moving along. While I’ve primarily used Trello and Asana for personal task management, I have also used both apps to manage projects with other team members. I didn’t see much of a difference between the two apps in this regard, but that’s probably due to the fact that I haven’t used them all that often for team collaboration. There may be many differentiating features with respect to team collaboration but I don’t have enough experience to determine them. Asana and Trello have mobile apps that accompany their desktop counterparts. Both apps are pretty easy to use and stay true to their design principles. I didn’t see a major difference in quality of the mobile apps outside of the aforementioned differences in the desktop version. So this isn’t a differentiating factor for me, but it may be for you. I use upwards of 10 apps while working everyday and many of them can talk to and exchange data with one another. Both Trello and Asana have integrations with many other apps that I use, but I’m not a big user of these integrations yet. Maybe I’ll find out if there are major differences down the road, but right now, this isn’t a big factor for me. Trello and Asana are both great project management tools to keep you organized and productive. Selecting which app works best for you really comes down to personal preference. For now, I’m going to stick with Trello. I think the visual user interface and flexibility of Trello trumps the structure and strong email reminders of Asana. 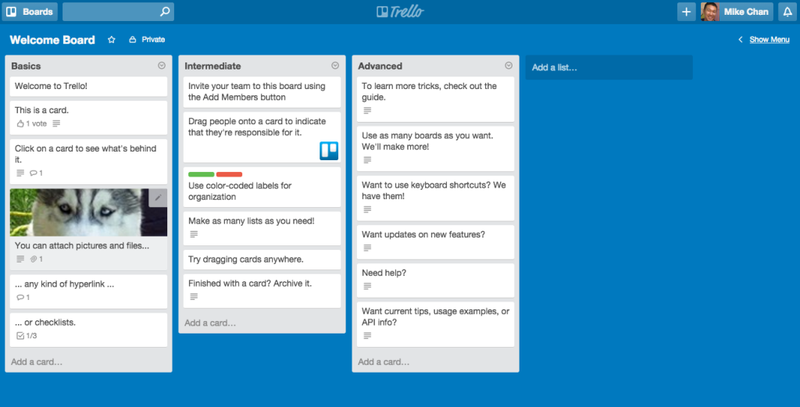 Have you used both Trello and Asana for project management? What are your thoughts about their differences, strengths, and weaknesses? I’d love to hear your opinions in the comments. Hey Allan – I don’t think you’re missing anything. One of my pet peeves of project management tools is exactly what you mention – none of them organize your tasks all that well. I’ve been searching for a good way to organize tasks by day, week, etc. in a way that works for me, and haven’t found a good solution. If you find one, let me know! You mention that you haven’t used Trello and Asana that often for team collaboration. – Has that changed lately? – And if so, what has your experiences been using the tools for team collaboration? Hey Andreas! I do use Trello for team collaboration. And I think it works well, but my teammates don’t use it as often as I do! I see what you’re saying about the tasks and subtasks. In Trello, you can’t add a due date to a “subtask” aka a checklist item, unless you create another card. Then it’s not really a subtask, it’s a whole task on its own, and the correlation to the original task isn’t there. Hey Mike, Asana seems to look pretty much the same as Trello now? Both have the Kanban boards. I haven’t used Asana in a while, but I heard that they added the boards. How do you like it? Thank you for this post, I was not sure what were the pros/cons of each and looked at many blogs. Yours is clear and provide valuable experience. I appreciated reading this. Thanks Andre-Claude! Glad it helped. Personally, I like Trello. I use it for my own blog to organize my post ideas. I can write down the idea, and as I work on it I can move it from list to list, from “ideas”, to “written”, then to “published”. I can even organize what posts I have scheduled and when. I have found though, that even though I like Trello, I also like Evernote. With Evernote I can write an article title then write my ideas for the post right on the “page”. In Evernote everything is organized into notebooks and pages. Thanks for sharing this post. I agree, Trello is much more visual and you can phase out your work to see progress, while Asana is more binary, with essentially only “To Do” and “Done” stages. I use Evernote to take notes (duh) but not so much to create content. Maybe I’ll give it a shot. Though both apps (Asana and Trello) are well integrated with our software, Time Doctor, I’m with you on this Mike. I haven’t used the integrations with Time Doctor but maybe I will try it with Trello. My partners and I need a way to track our projects and tasks and see what progress we each have made. Does Trello or Asana have a cost to use? Which one is easiest to use particularly for several members to access? Both are free unless you have a ton of team members or need upgraded features. Both are pretty good for team collaboration. It boils down to what tracking features you’re looking for and your personal preference in user interface.